Readers of my last post about my visits to Collard Hill may have got the impression that it was a disappointment. 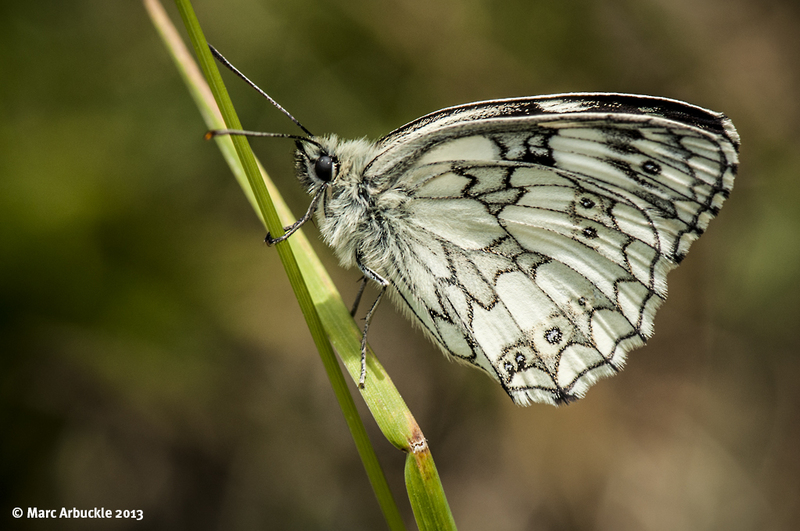 It wasn’t, the view from the Polden Hills is breathtaking and freshly emerged specimens of the monochromatic magnificence that is the Marbled White Melanargia galathia were abundant. I’m often asked which is my favourite butterfly and that’s a really tough call as I have so many. But, this is possibly my favourite ‘white’ even if technically it’s a ‘brown’. It’s one of those butterflies which is just as beautiful when viewed from the side as it is when it has its wings fully open. Side on it has the subtle understated beauty of scrimshaw. A delicate pen and ink doodle on clean white paper. Whimsical line, half-finished circles and geometric shapes. Finished with a few touches of soft watercolour grey. Above it’s a much wilder affair altogether, a bold mix of marbled lamp black, warm grey and creamy-white. An expressionistic tour de force designed to dazzle and confuse the predator. I love the way they float and glide through and over the tall dry grass like aerial zebras. Thanks Lucy. They are rather underrated butterflies in my opinion.